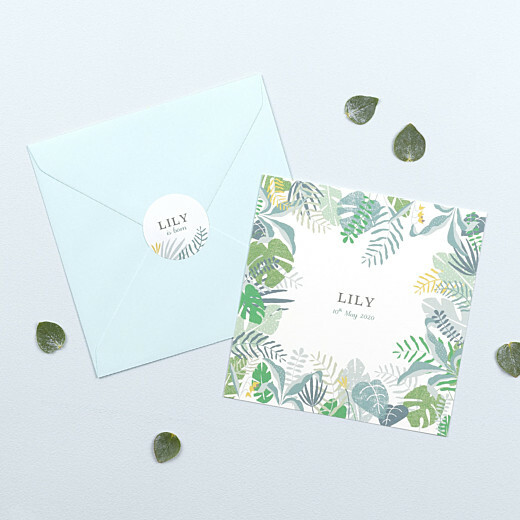 Create unique envelope seals or personalise name labels with the help of our “Tropical Garden” personalised baby stickers. Designed by Mr and Mrs Clynk, to match their “Tropical Garden” baby thank you cards and baby announcements, these personalised baby stickers will feature your child’s name nestled on a bed of jungle foliage. These personalised baby stickers are ideal for a jungle-themed birthday party or baby shower and can be easily incorporated into your decorations, thanks to their convenient size! You can order these personalised baby stickers in sheets of ten, and will be able to use any spare baby stickers easily to label everyday items belonging to your little one! Available in neutral tropical green, these personalised baby stickers are suitable for boys and girls. It is easy to create your personalised baby stickers online. Simply replace our sample text with your child’s name and birth date, or personalise your baby stickers with the message of your choice. As with all of our personalised stationery, your personalised baby stickers will be checked by our proofreaders and graphic designers before being printed on our high-quality paper. If it is the jungle-inspired design that drew you to these personalised baby stickers, then you may also like our “Birds of a Feather” baby stickers from the same talented designers.